On 31st August 2018 the United Nations High Commissioner for Human Rights, Zeid Ra’ad al-Hussein, finished his four-year mandate, passing the handover to his successor Michelle Bachelet. Zeid bids farewell bequeathing to the international community and to civil society a last thought, a message “of courage and defiance, and a longing for the leadership of the just”. The High Commissioner reminds that Winston Churchill was right when he claimed that of all human qualities, courage was the most esteemed, because it guaranteed all others. Moral courage is the companion of great leadership. No politician could ever be viewed as exceptional unless he or she had it in spades. And historically there would have been no social progress if not for the presence of specific humans dissenting and breaking from herd-inspired suspicion and fear. At best, courage is self-sacrificing, non-violent, modest and based on universal principles, and immensely powerful. Think Mahatma Gandhi or Martin Luther King Jr. Regrettably, courage is also rare and dangerous: both Gandhi and Martin Luther King were assassinated. Zeid invites us to look at today’s politicians. First, those who occupy so much of the news media’s attention: the Trumps, the Orbans, the Salvinis. Keen to be viewed as the virile leaders of their respective countries; eager to inflate their image by harming migrants and refugees, the most vulnerable in society. “If there is courage in that, Zeid affirms, I fail to see it. Authoritarian leaders, or elected leaders inclined toward it, are bullies, deceivers, selfish cowards". “If they are growing in number, Zeid claims, it is because (with exceptions) many other politicians are mediocre. They, too, are focused on their own image, the vanities associated with protocol and re-election. Too busy with themselves, or too afraid to stand up to the demagogues and for others, they seem to shelter in the safety of silence and shuffled papers. Only when they leave public office do some speak up, discovering their courage rather belatedly. Many come and go; no one really notices”. In consequence, Zeid asserts, too many summits and conferences held between states are tortured affairs that lack profundity but are full of jargon and tiresome clichés that are, in a word, meaningless. What is absent is a sincere will to work together, though all will claim—again, under the lights and on camera—that they are wholly committed to doing so. The systems for states to act collectively at higher levels in pursuit of solutions are decomposing. There are signs of it everywhere we care to look. Many have lost faith in international law and in the security architecture. And when multiple stress fractures already exist—the result of decades of mediocre leadership—all that’s required is a tripwire. To heal those fractures we must think differently, think more about human rights, and do this with some urgency. 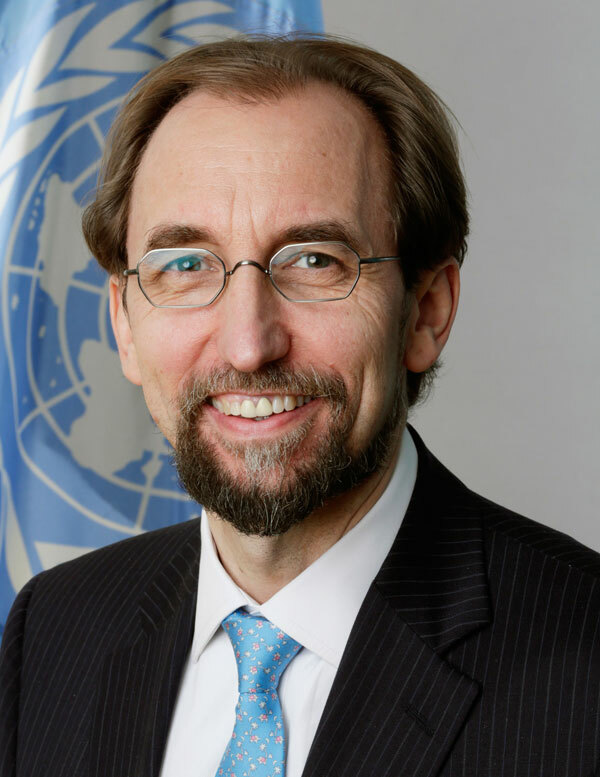 Zeid says: “and that suffering, which I have either seen first-hand or which was conveyed to me vividly by the victims, reflects a massive dereliction of the duty to serve, by those who exercise sovereignty on behalf of their people. Across the world, in both the northern and southern hemispheres, there are politicians who are too self-serving, or too spiteful, to care for and protect the most vulnerable. They are not just cowardly but profoundly foolish, because in producing these stress fractures, they place at risk not only their own futures, but everyone else’s as well. If we do not change course quickly, we will inevitably encounter an incident where that first domino is tipped—triggering a sequence of unstoppable events that will mark the end of our time on this tiny planet”. The High Commissioner lies his hope in a set of people not widely known internationally, but familiar to those in the human rights community. ”Unlike the self-promoters—the elected xenophobes and charlatans—these people do have courage. They have no state power to hide behind: instead, they step forward. They are the leaders of communities and social movements, big and small, who are willing to forfeit everything—including their lives—in defence of human rights. Their valour is unalloyed; it is selfless. There is no discretion or weakness here. They represent the best of us. This is what true leaders look like”.